The 2012 cruise season starts this Saturday in Montreal with the arrival of the Maasdam. The Port of Montreal said it is expecting a record 55,000 passengers for the season, up 46 percent from last year. That means from May 12 to October 24, 2012, 49,000 passengers are expected to transit through the terminal on 35 scheduled international calls, and a further 6,500 will embark on domestic cruises, primarily for the Magdalen Islands. In addition will be 14,000 crew members. 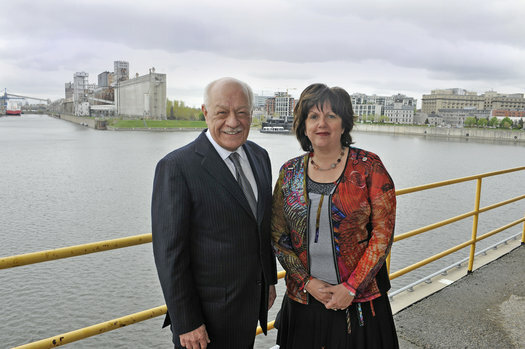 “I am absolutely thrilled by these results that show a very promising future for Montreal’s international cruise industry as well as significant economic spinoffs for the city,” stated Sylvie Vachon, president and CEO of the Montreal Port Authority, at a press conference held today at the Iberville Passenger Terminal. “The success of the 2012 season isn’t a coincidence. Those involved in this rapidly developing industry have joined forces on the Montreal Cruise Committee and have established the success of this sector as a major priority,” said the Charles Lapointe, president and CEO of Tourisme Montreal. Led by Tourisme Montreal and the Montreal Port Authority, the Montreal Cruise Committee brings together Aeroports de Montreal, the Board of Trade of Metropolitan Montreal, the Old Port of Montreal Corporation, the Hotel Association of Greater Montreal, the City of Montreal, Casino de Montreal and the Societe de developpement commercial du Vieux-Montreal. The committee is also supported by the Ministere du Tourisme du Quebec. The 2012 cruise season is expected to generate $14 million in economic benefits. In related news, Vachon received the Prix Orchidee from the East Montreal Chamber of Commerce at a ceremony Wednesday night for her commitment and outstanding contribution to East Montreal’s economic and social development.